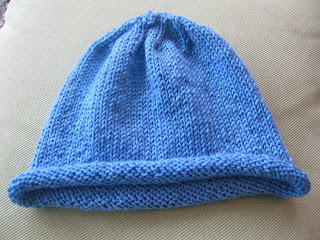 Here is my first knitted hat using circular needles! It was very quick to knit, I did not drop any stitches, and it was simple by design so I could get used to the needles. I still need to get comfortable finishing it, but I am happy with how it turned out. I will start the next one with K2P2 for about one inch or so for a different look. The yarn is so soft! It is Ella Rae's Cozy Soft (25% Superwash Wool, 75% acrylic), the needle size was US 7 (4.5mm), 16" (40 cm) by Knitter's Pride. I decided to go out and get some stitch markers which will help when I start decreasing stitches to finish off the hat. I used yarn as markers and did not like it much. If I get brave I will try socks next!!! Which pattern did you use?